Some tips for how to stay chip-free, and an explanation of how we fix chips. While driving, our vehicle’s spinning wheels can kick up small rocks and fling them around. 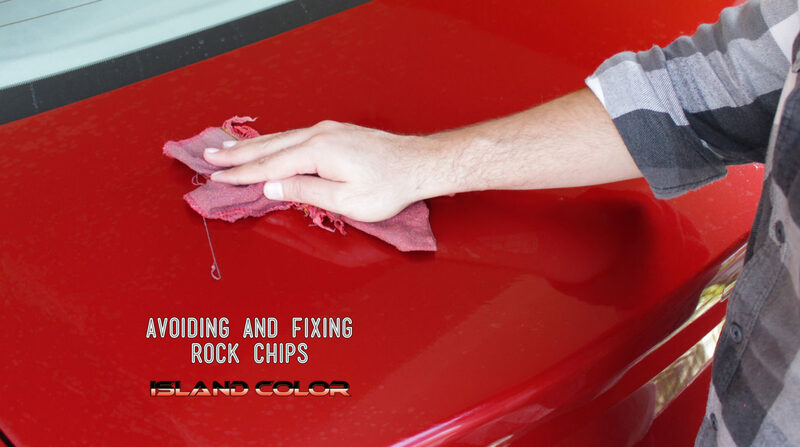 Follow these tips to minimize the amount of damage done to your car by scattering rock chips while driving. Especially when traveling at fast speeds or on rough terrain, it is a good idea to keep a large distance between yourself and the motorist in front of you. Following too closely behind semis, large trucks, or even fast-moving passenger cars can result in serious damage to your windshield and body panels. Even on a seemingly clean road, vehicles can pick up and scatter sand and small pieces of grit; if you’ve ever seen a sand-blaster, you understand how severely small debris can damage paint. Keeping a reasonable distance not only protects your vehicle from scattered debris, but gives you more time to react if something unexpected happens in front of you. When considering solid debris kicked up by our vehicle’s wheels, speed is not on our side. The faster your wheels spin, the more likely your tires are to pick up debris and damage your vehicle. To limit the number of rocks picked up, and the amount of damage they are able to do to your vehicle, it is imperative to slow down. If you encounter gravel roads or even asphalt roads with higher than normal levels of debris, it is in the best interest of you and your vehicle to slow down and avoid sudden acceleration. If slowing down by a few km/h reduces the amount that gravel jumps up to only a few inches, taking that precaution is well worth the effort for the sake of your car’s bodywork and underside. A scenario where this might occur on the highway would be noticing loose gravel scattered about the road. From your highway speed of 80km/h (or whatever is marked), it would be a good idea to smoothly and safely reduce your speed until you are past the gravel section. Awareness is the best recommendation for avoiding damage from scattered road debris. Especially on long highway drives, it can become easy to ease back into a more passive state of mind. However, paying close attention to what is on the road ahead will give you the edge against damage. Noticing things like gravelly roads or large trucks kicking up debris before actually encountering them gives you the best chance to avoid damage altogether.